I wrote about KLSI in back in August and October. KLSI Moss Beach is or was associated with two other stations, WAZQ in Key West, Florida and KAQQ in Midland, Texas. There have been some developments. The music has shifted more toward contemporary songs and away from oldies. In November someone commented that KAQQ had become a Christian station, KLPN. Also in November, a public radio station in Marin interfered with it almost every day. At some point, the announcement changed from "KLSI Moss Beach" to "KLSI Moss Beach, San Francisco." I have found so far that I can only get the station while driving along the Great Highway in San Francisco. I guess that counts. During the big storm in January and for a while after, the station may have been off the air. I noticed recently that the music sometimes stops then starts again. My wife said it sounds like streaming audio. That may be how they are distributing the broadcast from Florida. I have heard more commercials, all for Key West businesses. Speaking of storms, we had violent rain this afternoon. I got soaked coming home. I may have mentioned that I enjoy the look of pre-WWII racing cars. 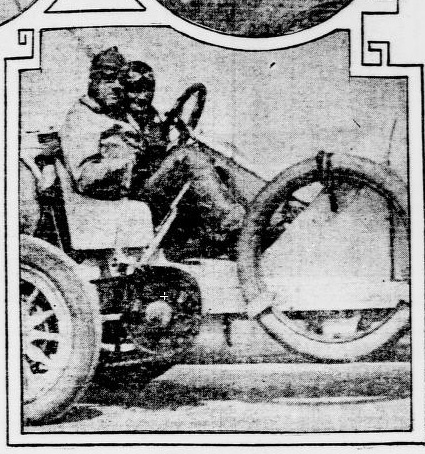 This photo from the 13-November-1910 New-York Tribune shows David Bruce-Brown at the wheel of his Benz, after winning a race at Savannah, Georgia. 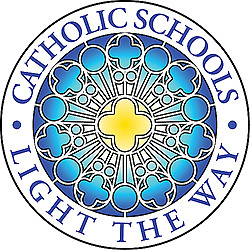 Today is the start of Catholic Schools Week. I'm grateful that my parents put me in Catholic schools for 12 years. I don't usually read the Irish Sporting Green, but my mother pointed out that Thursday's obituaries listed two of my old teachers, in consecutive entries. Anne Bagdonas was my Fifth Grade teacher at Saint Monicas. I will always be grateful because she was the first teacher who encouraged me to write stories and use my imagination. She also let me be the Wizard in a puppet production of The Wizard of Oz. I remember other teachers sending people over to have her make me rehearse more quietly. Father John Becker, SJ, was my Junior year English teacher at Saint Ignatius. He encouraged me to write more analytically and to read more critically. It is because of Father Becker that I can still recite most of the prologue of The Canterbury Tales from memory. Sadly, I seem to have forgotten most of Richard III's oration before the Battle of Bosworth Field. "Amaze the welkin with your broken staves" has always stuck in my mind. We drove by Sharp Park Golf Course today and saw that Laguna Salada has again returned. There was lots of rain overnight. Yesterday I noticed that samTrans had put up a new bus shelter. Years ago the old shelter was single width. Then they expanded it to double width. The new shelter is single width, and has no bench. That will be hard on a few commuters and lots of high school kids who hang out in the afternoon. Also yesterday, when the bus home dove down the hill and took the Manor exit, we noticed that the McDonalds had been torn down. It has rained all day today. At lunch time, I went downstairs to look. It was coming down hard. 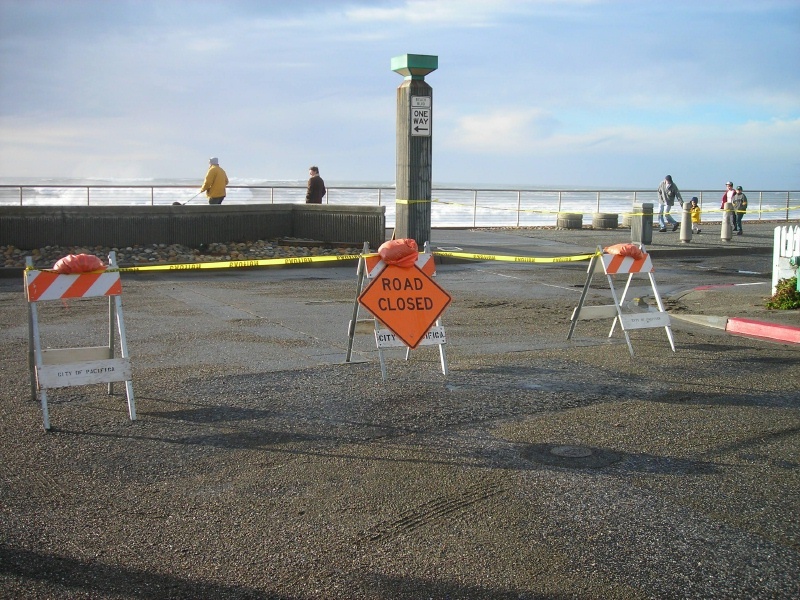 My wife called in the afternoon and said someone had mentioned that there was flooding on Linda Mar Boulevard near the Park and Ride. I took the first bus home, which goes on 101, and it was a slow ride. When we got to Crespi, we saw many cars heading towards the beach. The driver stopped at Linda Mar and De Solo and said "It's flooded." We got off and walked to the Park and Ride lot. There were saw horses blocking westbound Linda Mar at De Solo and a police car parked at the first turn into the shopping center. Traffic was allowed eastbound, but there was a big puddle at the main driveway from the shopping center. I got into the car and went to pull out, and found that a bunch of cars had run around the saw horses. I'm not sure if the police were getting ready to open the road. I drove home slowly. The lights have flickered, but have stayed on so far. 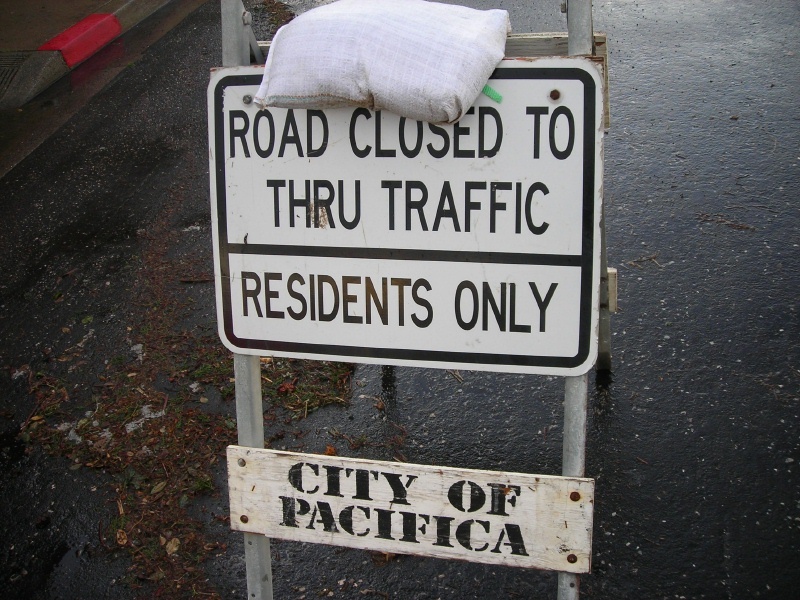 I took this photo on 05-January-2008 at Palmetto and Carmel. Today I didn't want to get my camera wet. It sure has been cold lately. I took this on 12-December-2007. I was impressed by the dedication of the people from the Freedom Train as they marched up Third Street in the rain. The 1910 Knox Model R, with a four cylinder, 40 horsepower engine. In 1908, Knox switched from air-cooled to water-cooled engines. We had a nice weekend. Saturday we took a drive to Half Moon Bay and visited Bay Books. We went to Five O'Clock mass. We went to "RO'STA QUERIA" for supper. The sign at Guererro's Tacqueria got damaged in the storm. Today we went to Good Shepherd and gave blood. Doctor P. H. Van der Weyde, who wrote the articles which gave this blog its name, published this article about the telephone in Manufacturer and Builder in 1869. I find the date interesting, since I was always taught that Alexander Graham Bell had invented the telephone in 1876. It turns out lots of people were working on the problem for a long time. This is true about most problems. This article did not carry a by-line, but books about the telephone patent disputes named Doctor V as the author. ONE of the most remarkable recent inventions connected with telegraphy is the telephone, an instrument which transmits directly the pitch of a sound by means of a telegraph-wire -- either an air-wire or submarine cable; so that, for instance, when the operator at one end of the wire sings or plays on an instrument any tune, as Yankee Doodle or Hail Columbia, it will be heard and distinguished plainly at the other end. This invention may, in its present state, have no direct practical application, but be a mere scientific, although highly interesting curiosity; but who can say that it does not contain the germ of a new method of working the telegraph, or some other useful practical purpose? The telephone is not. the result of an accidental discovery, but of a thorough study of the laws of electromagnetism and of sound. It is founded on the fact that the difference in pitch of different tones is caused by different velocities of vibrations of the elastic sounding body; which vibrations are transmitted to and by the air with exactly the same velocity, and from the air may be communicated to a properly stretched membrane, like a piece of bladder or very thin sheet of India-rubber, stretched like a drumhead, which these also will vibrate with exactly the same velocity as the air and the original sounding body, be it the human voice, organ-pipe, string, or any musical instrument. If, now, at the centre of this little drum-head there be attached a small disk of some metal not easily burned by electric currents -- for instance, platinum -- while at the same time a platinum point may, by means of a screw, be so adjusted as to come very nearly in contact with this small platinum disk, it is clear that, when the membrane is put in vibration, a succession of contacts between the disk and point will be produced, of which the number in each second will exactly correspond with the number of vibrations in each second of the sounding body, or the tone produced by it. That part of the apparatus which serves to send off the tune or melody is represented in the illustration, Fig. 2. It consists simply of a square wooden box, provided at the side with a kind of mouth-piece similar to that of a speaking-tube, and at the top with an opening, over which the membrane just mentioned has been stretched. The small disk of platinum attached to the centre of this little drum-head is, by means of a very flexible strip of some metal that conducts well, attached to one pole of the galvanic battery, of which only one cup is represented in the figure, although for a long wire several cups will, of course, he required. The reason why this connection near the platinum disk is a flat, thin and flexible strip is, that any rigidity would interfere with the freedom of vibration of the membrane to which it is attached. The point coming in contact with this small vibrating disk is connected with the ground-wire, the other pole of the battery with the air wire or submarine cable. It is clear, from this explanation, that at every contact of the platinum point a wave of electricity will be sent over the wire, and as many waves in a second as there are contacts; and as there as many contacts as there are vibrations in every second, the number of electric waves will be always exactly equal to the number of vibrations corresponding with the pitch of each tone, be it fifty, one hundred, two hundred, or five hundred in every second. 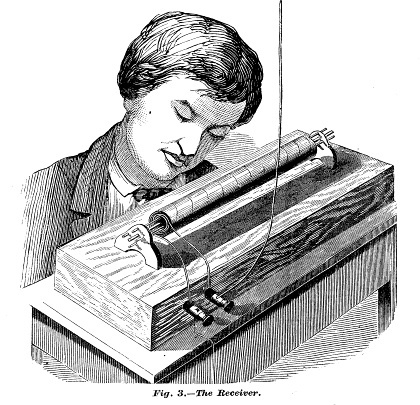 The instrument in which this succession of waves is made audible at the other end of the telegraph-wire is founded on the fact, first investigated by Professor Henry, of the Smithsonian Institute at Washington, that iron bars, when becoming magnetic by means of electric currents passing around them, become slightly elongated, and at the interruption of the current are at once restored to their original length. It is represented in the cut, Fig. 3, and consists of an elongated wooden box, of which the top is made of thin pine wood, similar to the sounding-board of a stringed musical instrument, to which are attached two bridges carrying long pieces of moderately thick and very soft iron wire, which for nearly their whole length are surrounded by a coil similar to the coil of the electro magnets used in telegraphing. One end of this coil is attached to the telegraph-wire, the other to the ground-wire, as represented in the figure. At every instant that a contact is established at the station where the sound is produced, and a current wave thus transmitted, these wires will become magnetic, and consequently elongated, and they will be shortened again at every interruption of the current and as these currents and interruptions succeed each other with the same velocity as the sound vibrations, the elongations and shortenings of the magnetized iron wire will succeed each other with exactly the same velocity, and consequently they will be thrown into a state of longitudinal vibrations corresponding with the original musical tone, which vibrations will then be communicated to the sounding-board in exactly the same manner as is the case with the vibrations of the strings in all stringed instruments, thus becoming more audible at the receiving station. It is clear, from the foregoing explanations, that no quality of tone can be transmitted. 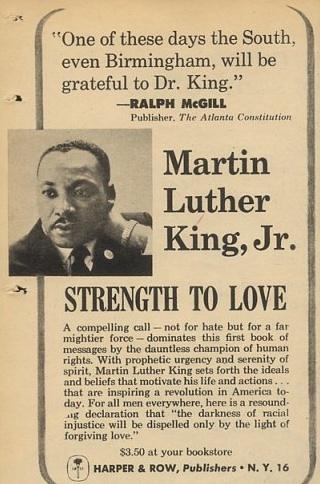 Much less can articulate words be sent, notwithstanding the enthusiastic prediction of some persons, who, when they first beheld this apparatus in operation, exclaimed, that now we would talk directly through the wire. It is from its nature able to transmit only pitch and rhythm, consequently melody, and nothing more. No harmony, nor different degree of strength or other qualities of tone can be transmitted; the receiving instrument in fact sings the melodies transmitted as it were with its own voice, resembling the humming of an insect, regardless of the quality of the tone which produces the original tune at the other end of the wire. This instrument is a German invention, and was first exhibited, in New-York, at the Polytechnic Association of the American Institute, by Dr. Van der Weyde. 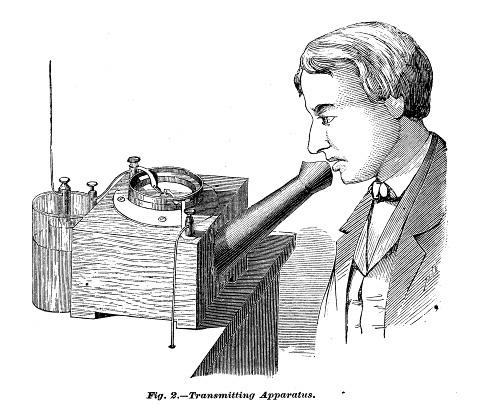 The original sounds were produced at the further extremity of the large building, (the Cooper Institute,) totally out of hearing of the association and the receiving instrument standing on the table of the lecture-room, produced with its own rather nasal twang the different tunes sung at the other end of the line, rather weakly, it is true, because of the weak battery used, but very distinctly and correctly. I've enjoyed movie serials ever since a Saturday-night television show ran Zombies of the Stratosphere one episode a week back in the 1960s. 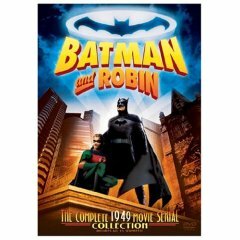 My latest serial is Columbia's 1949 Batman and Robin, which was a sequel to The Batman from 1943. I've also been a fan of Batman since I first saw the television show and read the comic books, also back in the 1960s. Superman has his powers because he was born on another planet. Spiderman has his because he was bitten by a radioactive spider. Batman is a self-made man. Columbia serials aren't as well regarded as Republic serials. My daughter noticed the lack of production values. When I pointed out that many sets and supporting actors were shared with the Three Stooges, she was even less impressed. Despite all that, I enjoyed it. I think I liked The Batman better -- I know I missed Doctor Daka -- but this one was all right. The actors who played Batman and Robin, Robert Lowrey and Johnny Duncan, played the roles differently. Lowrey was very diffident and bored as Bruce Wayne. Many reviewers have complained that his cowl did not fit properly and he often had to tilt his head back to see what was going on. I only noticed that a few times, especially after vigorous running. Many reviewers have pointed out that Duncan was a tough looking Robin, tougher than anyone else who played the role. I didn't have a problem with that. I'd want a tough guy backing me up if I was fighting crime. There was no Batmobile, only a Mercury convertible, which people sometimes recognized as Bruce Wayne's car. That was disappointing. Wayne Manor was a suburban ranch house. There were nice views of Southern Pacific locomotives in two episodes. The villian, called The Wizard, was not impressive, especially when his invisibility device blew a fuse and he was left running around in broad daylight. He stole a device which was capable of controlling any moving machine remotely. I'm not sure how that would work with a machine like a steam locomotive. His henchmen, who I could not tell apart, reached his hideout in a remote-controlled or automatic submarine. That seemed to be awfully complicated. In the end, though, everything kept moving along. I was sad to see The Wizard get foiled and the whole thing grind to a halt. 1. 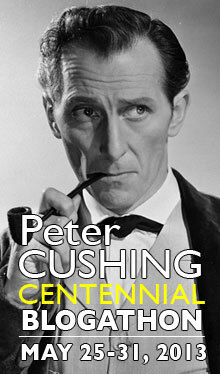 A bunch of people died, including Oscar Peterson, Sir Edmund Hillary, and Vampira. 2. I joined two very interesting discussion sites, Nitrateville (http://www.nitrateville.com/) about classic films and SilentComedians.com (http://www.silentcomedians.com/) about, well, you can guess. 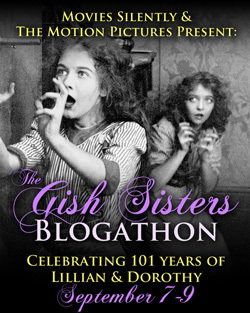 From a posting on the latter I learned that one of my entries in last year's Slapstick Blog-a-Thon (http://filmyear.typepad.com/blog/2007/09/slapstick-blo-1.html) was wrong about the way that Billie Ritchie died (http://cablecarguy.blogspot.com/2007/09/killed-by-ostrich-september-9-2007.html). I've made an update. 3. I realized that I had never mentioned a wonderful bay cruise that we took on 30-December-2007. 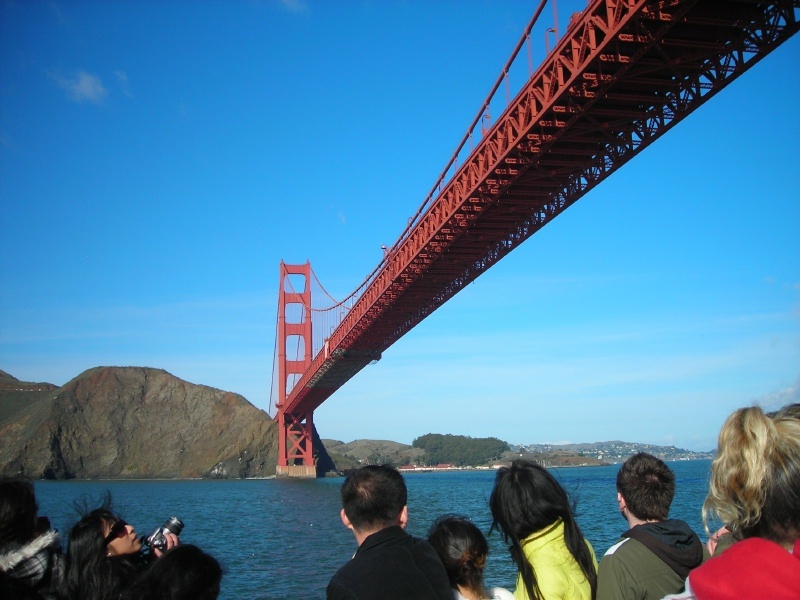 The photo, which I took that day, shows the view as we returned under the Golden Gate Bridge. It was a clear day and not particularly cold. L A Thompson (no relation) was a pioneer designer and builder of roller coasters. In 1888 he proposed using the same techniques to operate an elevated railway. Trains would have gripped a cable on leaving each station, which would have pulled the car to the top of an incline. The train would have automatically dropped the cable and coasted to the next station. A slight upgrade into each station would have helped to slow the train. It would have been a fun ride if it had been built. When I got to the Park and Ride yesterday on my way home, I saw that they had torn down the damaged bus shelter. It rained yesterday morning. San Mateo County decided that I didn't need to appear for my jury duty today, so I worked from home. It was very cold. 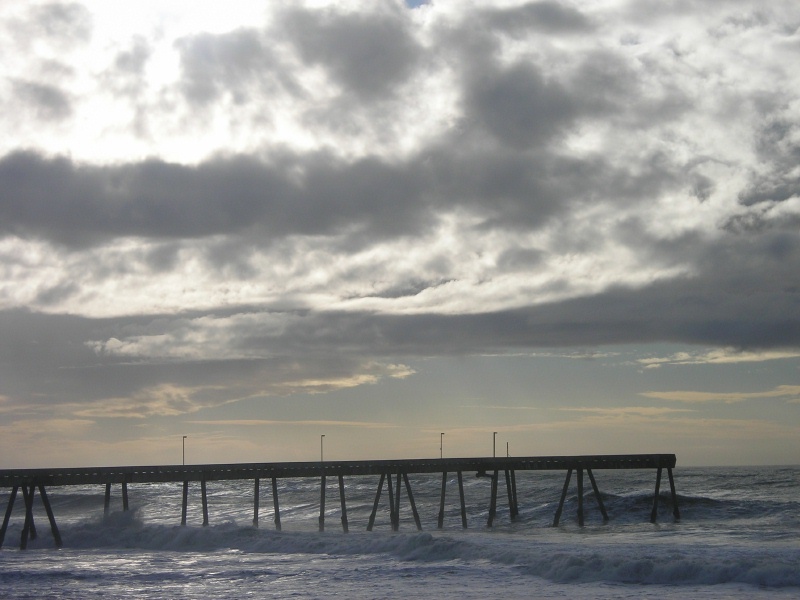 I took this photo of the Pacifica Pier on 05-January-2008. A sign at Carmel and Palmetto. 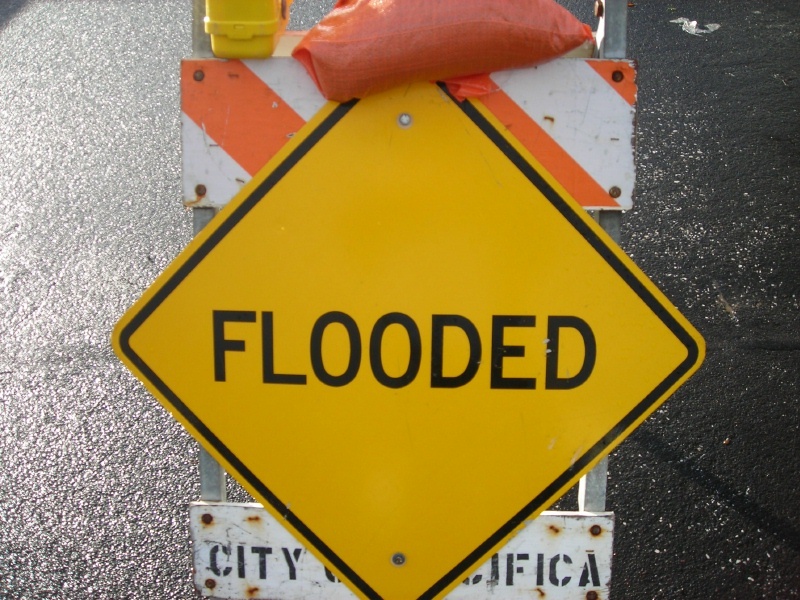 Every street heading towards the beach in this area had one of these and one that said "Flooded". We had more rain last night, but it wasn't heavy. I saw sun today. I took this photo on 05-January-2008. Paloma Avenue and Beach Boulevard this afternoon. There was a lot of sand and water on the road. Many people and dogs were out to see the waves. Parts of northern had no power till 11:30 last night. They lost power again this morning. We were at home about 11 this morning. I saw a flash of light, and then heard a crack of thunder. 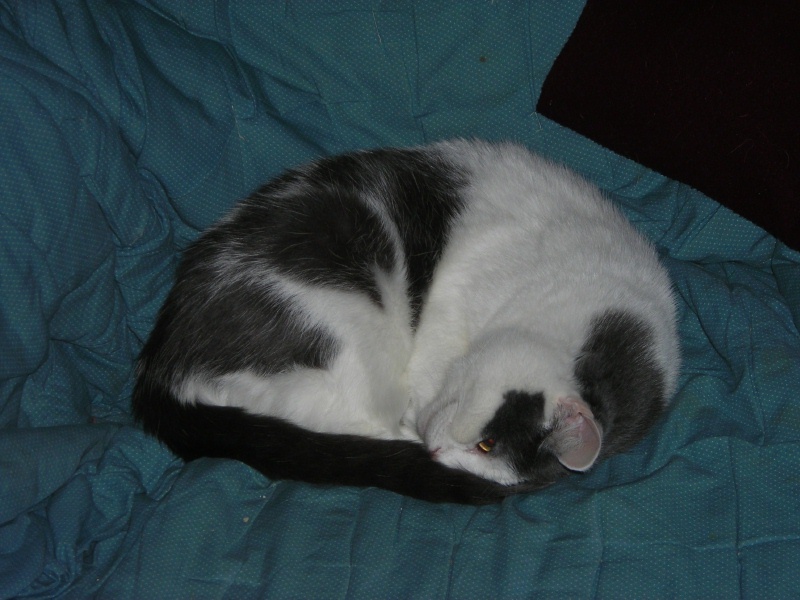 This was followed by another boom as the cat ran out the kitchen, breaking the sound barrier. Then it rained hard, but for a short time. We went to mass for the Feast of the Epiphany. I'll miss the Christmas music. I was worried yesterday morning when KCBS said the Coast Guard had cancelled all leaves because of the series of approaching storms. It rained yesterday, but it wasn't strong. 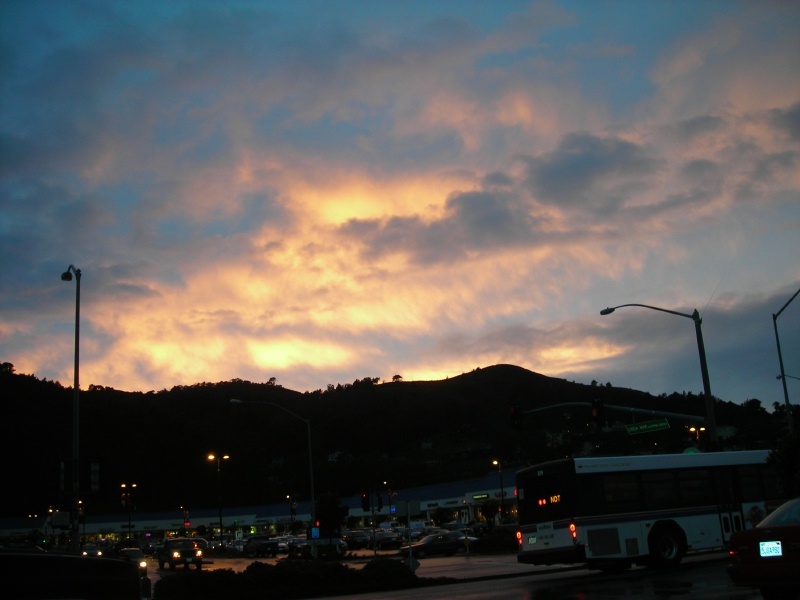 I took this photo at the park and ride, showing the clearing sky over San Pedro Mountain. We heard the wind blowing and rain falling all night. The power went out when I got to the bottom of the stairs in the morning, but came right back on. When I left the house, I misjudged my jump and didn't get across the big puddle near the driveway. I drove slowly to the beach, avoiding fallen branches. When I got to the park and ride lot, I leaned against the wind and walked to the shelter, looking forward to getting inside. First I noticed that the two windows on the landward side had blown out. Then I noticed that the translucent roof on the ocean side was on the floor of the shelter, upside-down and shattered. I picked past it and stood in the rain, waiting for the bus. Then I noticed that the metal frame of the shelter was rocking back and forth in the wind. I thought about getting out of there, but our DX driver took pity and pulled up to let me on. It was a long, slow trip into the city. The power went off again before the bus pulled out, but came on again right away. The power was off again by the time we got to Vallemar. I got a call from a member of the team who wanted to work from home. Another guy in Elk Grove didn't have power till 1pm. The school where my wife teaches was closed. She and my daughter got home and found a leak upstairs. The management company sent someone to look. Some shingles had blown off the roof. The wind and rain died down after noon. 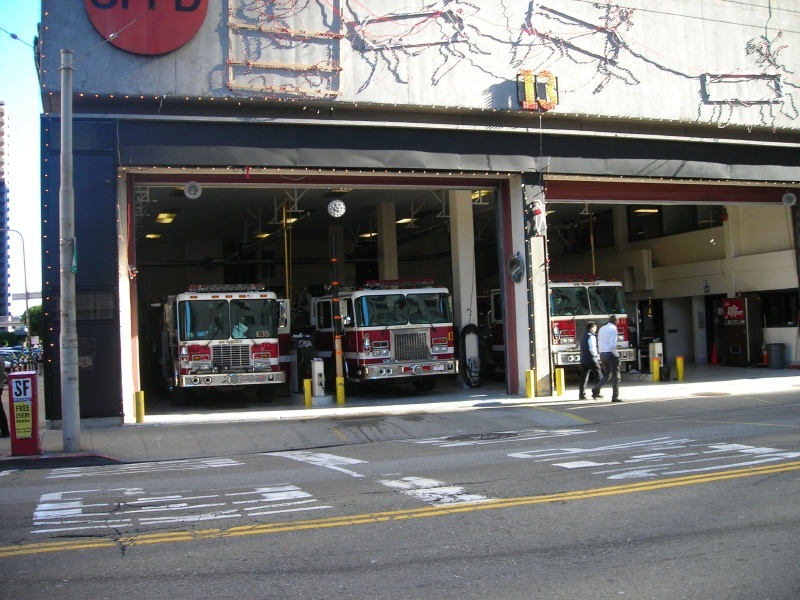 Company 13 (Engine 35, Truck 13, Engine 13) at Sansome and Clay is, I have heard, the busiest firehouse in the city. I took this photo on Boxing Day, 2007. 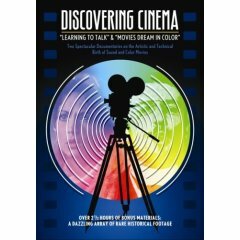 This boxed set from Flicker Alley (http://www.flickeralley.com/) includes two French-made documentaries, "Learning to Talk" and "Movies Dream in color, and a broad selection of extras that illustrate attempts to create sound films and color films. Each documentary and set of extras is organized into three streams that ran in parallel. For sound films, they were live sound, sound on disk, and sound on film. For color films, they were applied color (hand-painting, stenciling, tinting and toning), additive color, and subtractive color. I think this was an excellent choice. The talking heads, mostly dubbed, were informative. I noticed that most of them had Italian family names, but spoke fluent French. The documentaries could not go into depth in the time allowed, but they explained the various processes clearly and included many excellent examples. The extras were almost better than the documentaries. 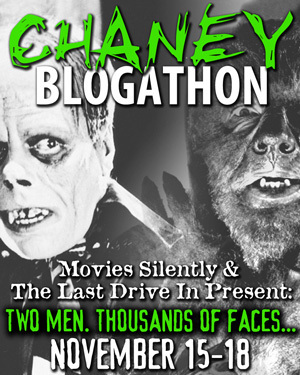 The sound examples included an excerpt from a strange 1920 movie called "The Chamber Mystery." Most of the time the characters spoke in balloons that popped up on the screen, but a few lines of dialogue were on conventional subtitles. 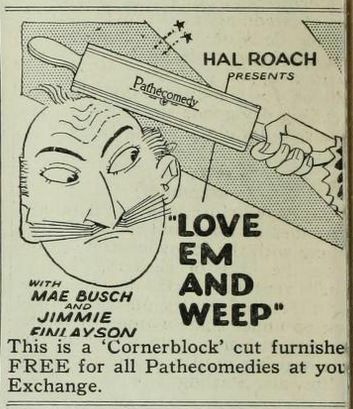 Two movies showed unidentified actors miming to Caruso records. The synchronization was excellent. I was happy to see Edison's 1913 "Nursery Favorites," which I have been anxious to see since I read Walter Kerr's The Silent Clowns. It was not as bad as I expected. The Queen of the Fairies did not sound like Barry White. The last sound extra was the only part-talkie short subject I have ever seen, an episode of Universal's "The Collegians". I didn't see how they decided when the talking should stop and the subtitles should start. The sound on disk extras reminded me of when I made Super 8 movies in high school. I had a hard time persuading my friends that we could not make talkies by recording the sound on my cassette player. The color extras included some Lumiere films that had been hand-colored. The contrast between the jumping color of those films and the later stencilled films was clear. There was an eleven-minute Kinemacolor film showing the dedication of the campanile in Venice. Ironically, only a few shots showed the campanile. I was impressed that the many shots taken from a boat did not seem to show fringing. Another film was a test of the Lumicolor process, which was an adaption of Lumiere's Autochrome, using particles of brewer's yeast instead of rice grains. It was a bit grainy, but the colors were good. The restored version of "La Cucaracha," the first live action production in three-color Technicolor, was pretty to look at, but fast-moving characters looked smeared. This may have been because of problems in transferring the video from PAL. 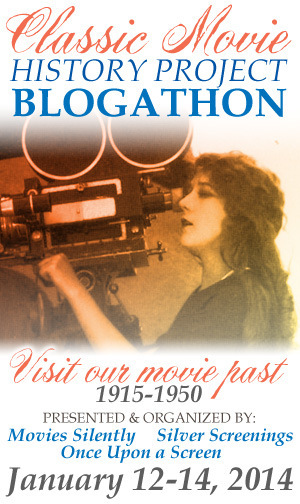 I wanted to recreate Kinemacolor in Super 8, but I could never figure out how to get the filter wheel to synchronize. My thanks to Serge Bromberg of Lobster Films and the many others who created this set. I recommend it highly.